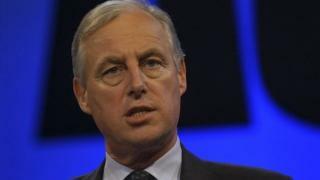 Senior Conservative MP Tim Yeo has lost his fight against being deselected by party activists. The former environment minister demanded the secret ballot by Tory members in South Suffolk after the association's committee voted not to re-adopt him as a candidate. Mr Yeo promised his "unqualified support" to his successor. The result of the count comes three days after fellow Tory MP Anne McIntosh was deselected. David Cameron had backed Mr Yeo, saying he would be a "great loss". Media captionTim Yeo: "I've actually been one of the most influential chairs of a select committee during this Parliament"
The 68-year-old, an MP since 1983, was cleared last year of breaking parliamentary rules on lobbying. He stood aside temporarily as chairman of the Commons Energy and Climate Committee while an investigation was carried out following a newspaper story. Mr Yeo returned to the role, but the executive committee of the South Suffolk Conservative Association voted in December against re-adopting him as a candidate. Reports suggest this reflected frustration among some members that he had not devoted enough time to the constituency while the standards inquiry was going on. But Mr Yeo, who said he was proud of his career and happy to be judged on his record, challenged the committee's verdict. This led to a postal vote by the association's 600 members, which was counted on Monday afternoon at Conservative headquarters in London. Party sources said there had been an 82% turnout in the ballot, but refused to give details of the margin of defeat. After the result was announced, Mr Yeo said the vote had been "on a knife edge". On his disagreements with activists, he told BBC Radio 4's PM: "There were a number of individual issues where I took a very strong view on principle and will continue to do so." Mr Yeo, who is in favour of the UK remaining in the European Union and a strong believer in climate change, said some of his opinions were "not widely supported". He said: "It has been a privilege to serve as MP for South Suffolk since 1983. I will continue to work for all my constituents until the general election next year. "I am immensely grateful to all those Conservative Party members who voted for me to continue as their MP. "I now ask them all to campaign for my successor with the same loyalty and dedication they have shown to me. I will give my full and unqualified support to whoever is chosen as the candidate here in South Suffolk. I wish him or her every success." Mr Yeo also served as a minister in the Home Office, Foreign Office and Department of Health in John Major and Margaret Thatcher's governments in the 1980s and 1990s. He won the Suffolk South seat with an 8,689 majority at the last general election. Toby Kramers, chairman of South Suffolk Conservative Association, said: "This has been a difficult time for the association. Our priority now is to work together for success in the European elections later this year." A Conservative spokesman said selection for the South Suffolk constituency, which was created in 1983 as a result of boundary changes, would "be opened in due course". For Labour, shadow Cabinet Office minister Jon Ashworth said the vote was "a blow to David Cameron's credibility" after he expressed his support for the MP. Last week, Ms McIntosh lost a vote of confidence among Conservative members in Thirsk and Malton, following a long-running dispute with constituency officials. She insisted she still planned to run again for Parliament at the 2015 general election as an independent. Reacting to the spate of de-selections, Conservative MEP Daniel Hannan tweeted that they were a recognition by activists that "there's a better candidate out there".